"It is the tale, not he who tells it." Many elements combined together make the Haunt what it is. All of the designs, monsters, and sets really make an impact, but if it were not for us fans selling the place out each year, Knott’s Scary Farm simply would not be what it is today. Fans expect and receive only the best from the Haunt. 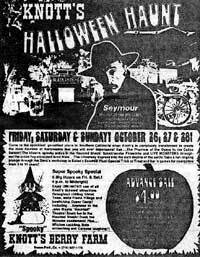 "Uncle" Mike Hansen was gracious enough to share some of his Haunt memories and pictures dating back to the very first Halloween Haunt in 1973. It was a lot different than the way we see it nowadays. I think it is incredibly interesting to find out what the history of the Haunt is. Knott’s Berry Farm’s official website does not go into too many details about the Haunt, and I have not seen any other websites out there that covers the early years. Let’s read on and find out what was happening back then, shall we? 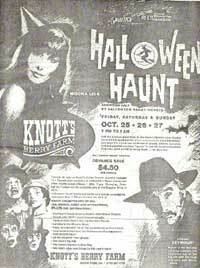 Knott’s Berry Farm’s official site does not go into too many details about what the Haunt was like in the early years. From what you remember, what was happening at the park back then? I was only 10 years old, but I don't remember it as being that elaborate (this is 27 years ago, though). In 1973, there simply weren't that many high-quality Halloween props around. I remember a lot of those jointed cardboard skeletons were used in the shops and food places. I don't think they were using the "scare cloth" (the cobwebbing) that year, but they were definitely using it soon after. I remember some Knott's employees hiding in the Calico Mine Train ride and, when it was very dark, they jumped up and sprayed Silly String at everyone. My mom got some in her eye. Kind of ruined the evening for her. There weren't that many street monsters then. Most everyone was hiding in the rides. Also, there were no walk-through mazes yet (except for the Haunted Shack, which I didn't go through). Most of the characters were from classic horror movies: Dracula, Frankenstein, The Wolf Man, etc. Knott's really hadn't tried creating their own set of characters yet. Did the word spread quickly, or was it some time before Knott's Scary Farm started to gain a big following? I think it was either number 3 or number 4 (1975-76) when I first heard that they were beginning to sell out some nights. That's when I remember the lines were a little annoying (unlike now when they're really annoying). Also, remember that (until the 5th annual in 1977) they didn't have any mazes. Only the Log Ride, the Mine ride, and the Haunted Shack were decorated and staffed for Halloween. Other attractions (like the Fiesta Village area, the Stagecoach, the train) were operable and working, but not much was done at the time to theme them. At that time, people could still see everything in just 4 or 5 hours. They had a lot of different shows back then, too. Some were onstage, but some were like sideshows--just a little set-up next to some ride and every half-hour or so the performers would come out and do their thing. Many were optical illusions (like a severed talking head, or a woman's head grafted onto a huge spider's body). I wish they'd bring these back. Were the monster's costumes always so intricate, or was there a certain time when they started to get more elaborate? Looking at my pictures from those years, you can really tell that Knott's wanted the costumed folks to look great. Some of them were more successful than others, but they all tried very hard. The only person selling quality masks at the time was Don Post Studios. Mostly classic horror stuff, so a lot of the characters came from his catalog (Mad Scientist, Wolf Man, Mole Man, Planet of the Apes, etc.). 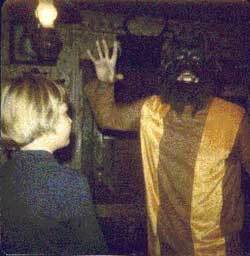 Knott's did not do any heavy prosthetic make-up (like Lion Man, the Green Goblin, or Pig Lady) for many years. What were some of the earlier themes for the mazes, and what about the Log Ride, Calico Mine Ride and Bear-y Tales Ride? Satan's Sawmill was the first theme for the Log Ride, but I can't remember for the life of me if the inside matched the name. 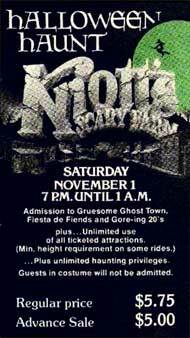 The next year it was called The Devil's Log Ride (so maybe it was themed Satanically, something they've definitely avoided since then), and then Terror Mountain Log Ride (a name they went back to in later years). The Mine Train was first themed as The Ghostway Express, then The Calico Phantom's Mine Ride, then The Haunted Mine Ride. All of them were pretty generic. Knott's really didn't have a firm idea of how to re-theme a ride for the first couple of years. They'd turn out the lights and put up cobwebs and put on masks but that was about it. For a while, anyway. And Knott's Bear-y Tales (aka Kingdom of the Dinosaurs) has never been done well. Okay, Lounge Lizards was funny, but.... The only time it unnerved me was when it was called The Dark. The whole thing was pitch black and, every once in a while, a monster (with a flashlight pointed at his or her face) would suddenly be right there at your car, and then disappear. Very cool. But re-theming that ride is kind of like re-theming D-land's Pinocchio ride for Halloween. Not impossible, but really not worth the headache. There were no mazes until the 5th annual. This first maze was "The Ten Chilling Chambers" and was incredibly popular. The wait was around an hour (which, in those days, was unheard of). This was in "Jeffries Barn," same place as "Mother Noose" and "Dead and Breakfast" have been. For the 6th annual, it was re-themed (slightly) and re-named The Trail of Terror. Again, kind of generic rooms (I can't even remember any of them). For the 7th annual, they kept The Trail of Terror, and also opened a 2nd maze, called The Chamber of Horrors. What was very cool about this second maze (made in the Livery Stable) is that it was plastered like a cave. Rough, uneven walls, low ceilings, etc. When you first walked in, they had highway emergency flashers embedded in the walls, so that the whole area was flashing on and off yellow. Wild. They had to dismantle it in 1980 because it (obviously) didn't meet the handicapped/wheelchair requirements. Oh well. In our "Through The Years" page, 1987, I describe my first viewing of the Hanging. What was happening with the Hanging (which was named the "Witches Revenge" at the time) prior to 1987? Yeah, for the longest time this was the hanging: a witch, in rolling cart, gets taken up to the gallows. As the charges are read to her, she gets the noose put on (and the safety cable attached)(oops, hope I didn't ruin the surprise). She then curses us all, and all of our families, and all of our pets' families, then she gets hung, there's a bunch of fire, she disappears, reappears on top of the Calico Saloon, then...um...that's about it. I don't know who first thought, "Hey! Let's make this funny," but god bless them. The first satirical one I remember is when Beetlejuice was there and Freddy pops out of a bunch of bananas. I'm sure that wasn't the very first time they used jokes (this was the 17th or 18th annual), but it's the first one I really noticed. I have a few of the recent hangings on videotape. "That's what you get when you poke a hauntess." My favorite line. Who were some of the early guest celebrities? The host for the first two Haunts was "The most sinister man to crawl on the face of the earth: Seymour (aka Larry Vincent)." 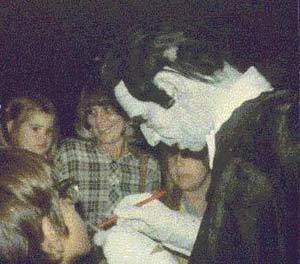 Seymour was the local Fright Night movie host on KHJ-TV (now KCAL) and was very popular at the time. If you can believe it, the lines to get into his show were longer than the Log Ride and the Mine Train. He had a very sardonic take on life, and he was constantly putting down the movies he showed. (For some reason, Knott's doesn't mention him, instead erroneously reporting that Wolfman Jack was the host from the beginning. 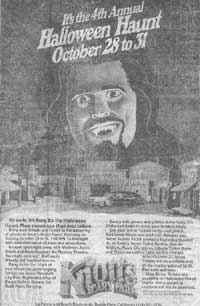 The Wolfman didn't start hosting until the 3rd annual, in 1975). Wolfman Jack was there from the 3rd to the 8th. "Weird Al" Yankovich was there at least twice (9th and 15th annual). A few minor comedians showed up at the 13th annual (anybody remember Byron Allen or Bruce "Babyman" Baum?) and, of course, our dear friend Elvira (Cassandra Peterson). I've met her a few times, actually, and she is simply one of the nicest people ever. What are your top 5 mazes/attractions that the Haunt has offered? Oh, my. Only five? Hmmmm. The very first Baits Motel (in Jeffries Barn) was terrific. It looked like a hotel, it had lots of Mrs. Bates' running around with big-ol' knives. Great soundtrack. The funhouse in Camp Snoopy has been the site of two faves: The Slaughterhouse and Uncle Ernie's Madhouse. The Slaughterhouse was totally over the top with gratuitous blood and body parts. Lots of psycho butchers and chainsaws. And U.E. 's Madhouse had (in its first year) evil killer clowns (another year it was an insane asylum--that was fun). I really loved Santa Claws in the log ride. The idea of a homicidal Santa Claus was absolutely perverse, terrifying, and really cool. The first Toxic Terror (also in the log ride) was very well-done. They had a huge tank trunk parked out front, lots of floating toxic waste barrels, uniforms for the employees, melted faces, glowing goo. Nice. Well, there you have it folks! Right from a person who lived it. Thanks Mike! All of the photographs that you see on this page are from Mike’s personal collection. If you have any more questions for Mike, feel free to email him. If you have some information on past Haunts, we would love to hear about it! Email me with your thoughts! The Haunt has had a wonderful history that keeps growing and growing as each year goes by. See you at the next one!